NY DEC's "Conservationist for Kids." Join the growing number of educators who use the environment to engage students in real learning. We can help you take natural teaching to a higher level! For more information or to register go to: www.mbc.edu/ebl or contact Dr. Tamra Willis, Graduate Teacher Education Program, Mary Baldwin College. 540-887-7135. 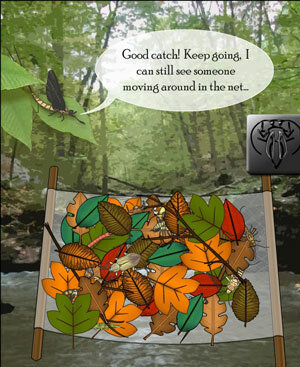 Aquatic Educators, Potomac Highlands Watershed School Benthic Macroinvertebrate and Stream Sampling Curriculum: Cacapon Institute just "went live" with the final element of the eSchool's benthic macroinvertebrate content - A Virtual Stream Sampler. Open up any classroom (High,,Middle, or Elementary) and you will see a benthic macroinvertebrate poster somewhere in the room. A click on the poster leads you to the benthic portal, with a suite of activities on benthic macroinvertebrates. These activities are designed to enhance the educational value of those hands-on trips down to the river. May 6, 2011. A Virtual Stream Sampler debuts in the Potomac Highlands Watershed School. This activity is a realistic simulation of a volunteer stream assessment. It includes water quality measurements, habitat assessments, and benthic macroinvertebrate collections. Just click on the BMI Poster in any classroom to enter the Benthic Portal, then click on the Virtual Stream Sampler icon. This activity completes the suite of eSchool lessons on stream sampling and benthic macroinvertebrates. Check out the New York State Department of Environmental Conservation's newsletter, "Conservationist for Kids." Each issue addresses a big environmental topic and explains it simply. Curriculum resources, classroom activities, and additional suggested resources are also provided.